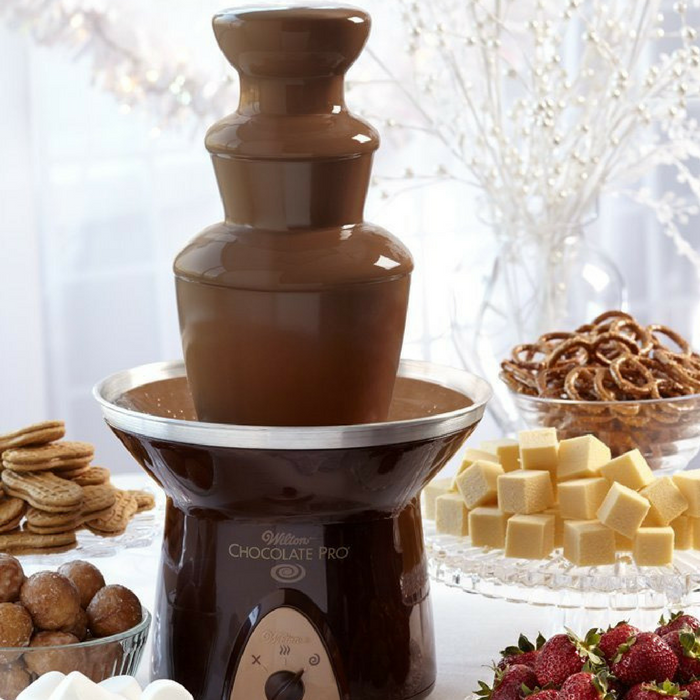 3-Tier Chocolate Fountain Just $47.98! Down From $110! PLUS FREE Shipping! You are here: Home / Great Deals / Amazon Deals / 3-Tier Chocolate Fountain Just $47.98! Down From $110! PLUS FREE Shipping! At Amazon, you can get this 3-Tier Chocolate Fountain for just $47.98 down from $109.99 PLUS FREE shipping! Make your next celebration a little sweeter. Use the Wilton chocolate fountain to DIY dessert. This beautiful three-tiered chocolate fountain will be the highlight of the party. It’s easy-to-use design melts up to 4-pounds of chocolate. Simply use the settings to preheat your chocolate fountain, then when it’s time to party, switch it to ‘flow’ to start the cascading melted chocolate fountain. Serve a variety of treats and snacks to dip. Your guests will love choosing their own treats to dip – from fruits like bananas and strawberries to marshmallows, potato chips, pretzels, cookies and more.